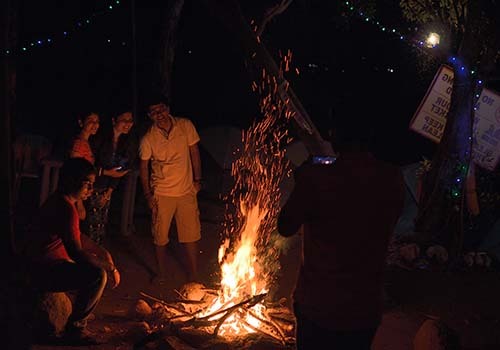 Our Pawna Lake Camping site is located near Kevre Village in Lonavala Pune. It is exactly at the base of Tung Fort. This region receives heavy rainfall during monsoon season. As a result, a man-made reservoir was formed which is known as Pawna Dam. The water of Pawna Lake is provided to Pimpri Chinchwad Municipal Corporation, Pune. Best place for camping in Pune region. The view from our Pawna Lake Camping site is mesmerizing. One can view the beautiful Pawna Lake, various forts such as Tung, Tikona, Lohgad & Visapur. Enjoy the various activities in the lake such as Kayaking, Paddle Boating, Speed Boat Ride and Swimming. It’s a perfect getaway for a weekend to relax and enjoy the time with your family in the laps of mother nature. Who can join for Pawna Lake camping near Mumbai? Anyone - Those who love to enjoy Camping, bonfire beside the lake with lovely food. it is the best option for overnight camping near Mumbai. Reach our Pawana Campsite at 4 pm by your own Car or Bike. You will be allocated the Tents. Unpack your bags, freshen up and settle down as snacks will be followed.